It's easy to update your credit card and plan info! Only the Account Owner and Billing Liaisons can see the Account page. Basecamp will always tell you which plan you're using, including any extra storage and the date and amount of the next charge. If you have a credit from a lump sum payment, we'll show that too. If you want to change your plan, click "See plans and upgrade or downgrade." For your security and protection, Basecamp only displays the last 4 digits of your credit card. Click "Change your credit card and billing information" to make updates. We'll charge you for your Basecamp account on a monthly basis. 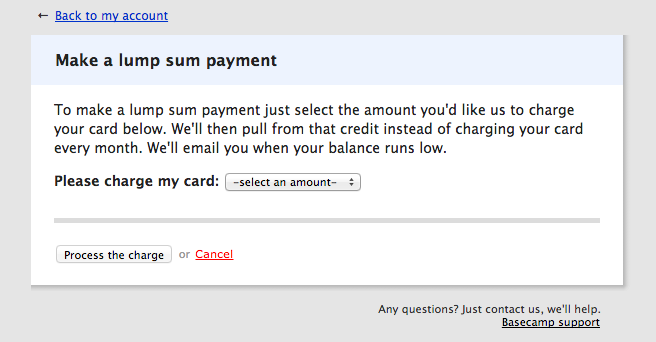 Sometimes, though, it's not convenient to have a recurring monthly charge. Lump sum payments can help! We'll make a bulk charge, and add the credit to your account. We withdraw from the balance each month, and send you an invoice as a reminder. We'll also let you know when the balance is running low. You won't see the lump sum option until you've picked a plan & added your credit card. Lump sum payments are non-refundable. 📹 Here's a video to walk you through it.